Calculates PH, Epoxy %, and Specific Gravity. 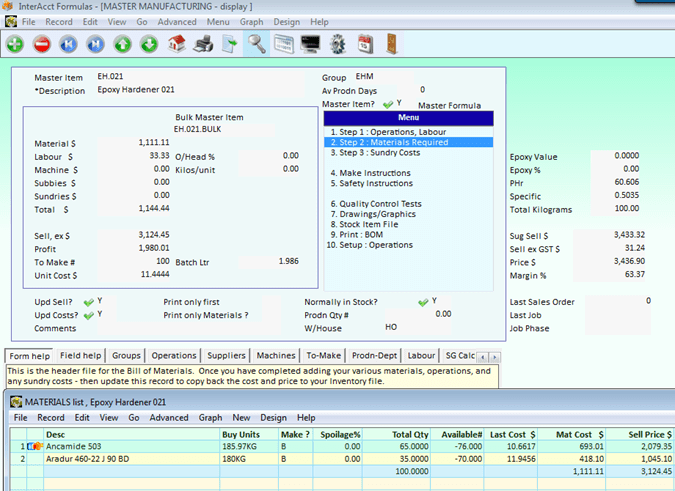 There are links to automatically create purchase orders, works orders, to reserve stock, and then to automatically issue materials to a production job. 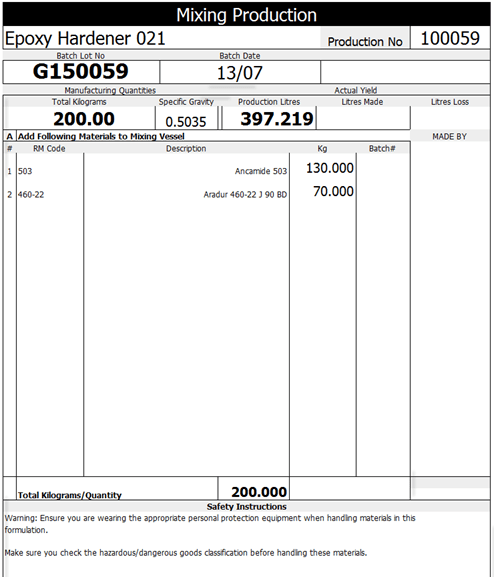 There is the option to input daily production complete quantities to automatically issue and calculate the related Cost Items used. The focus is on speed of data input, accuracy, and simplicity. The first step in creating your Bill of Materials, is to add the Materials, Sub Assemblies, and Finished Goods as Stock items. 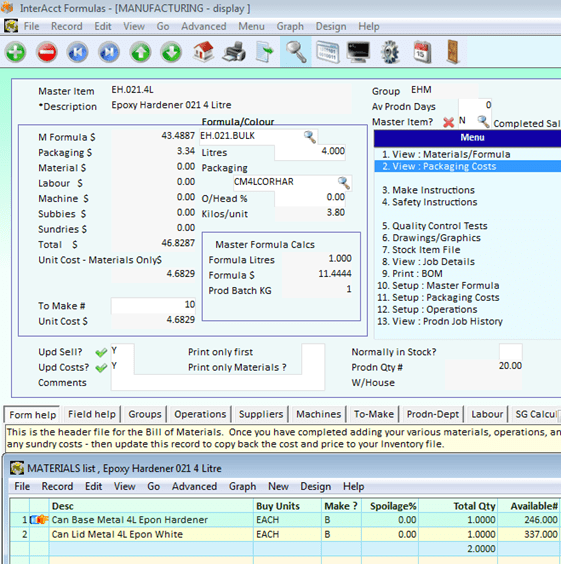 For each “Make” item there is a Bill of Material (BOM) attached. 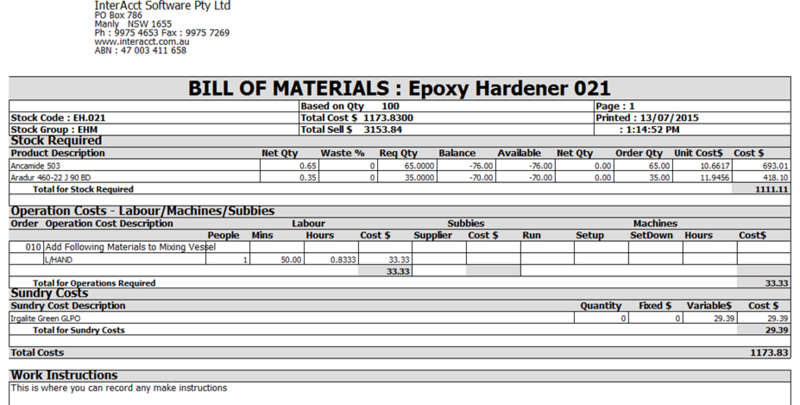 The Bill of Materials is typically a combination of Materials, Direct Factory Labour, Machine time, Sub Contractor charges, and Sundry costs (including indirect overhead recovery). Materials can also be “Make” items. Calculations of quantities required can be Each, Linear, Square, or Cubic – with wastage factors added. The current stock balance of materials is shown as an indication of what can be made. Graphic images can be attached to the BOM along with work instructions. To save time, a BOM can be used to copy and create another BOM – and them you simply modify the copy to suit. BOM can be automatically re-costed at any time – based on the latest stock cost information. Production jobs for a manufactured stock item can be for stock, and/or for one or more sales backorders. 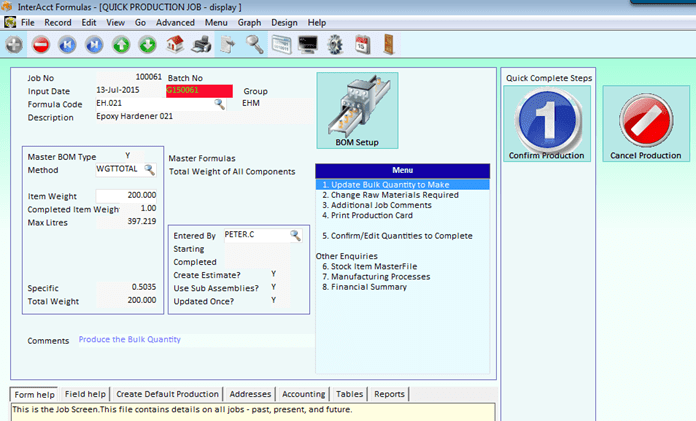 The BOM is copied across to automatically create the production job’s estimate. Existing material stock can be reserved at any time, and pro-forma purchase orders created automatically for what is needed. Availability checks can be performed at any time to check whether all materials are available to start production. 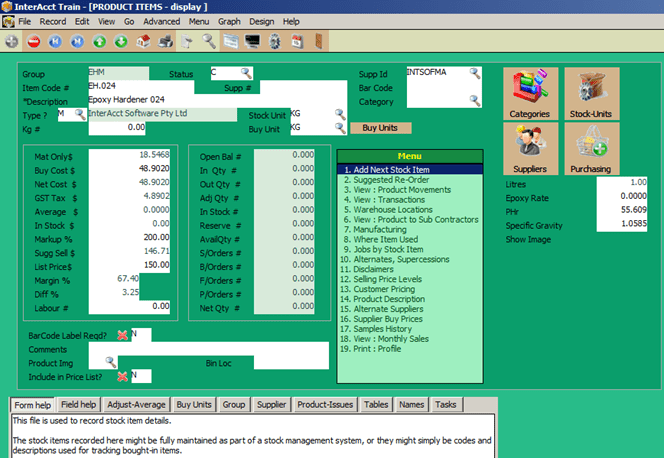 Materials can be issued to the job from stock automatically. As an option, you can input the actual production quantities each day, and InterAcct will calculate the labour time and materials used automatically. Variance analysis is shown between a job’s budget and the actual cost items so that you may adjust the BOM accordingly. As the finished stock item is completed production, it is transferred into stock. 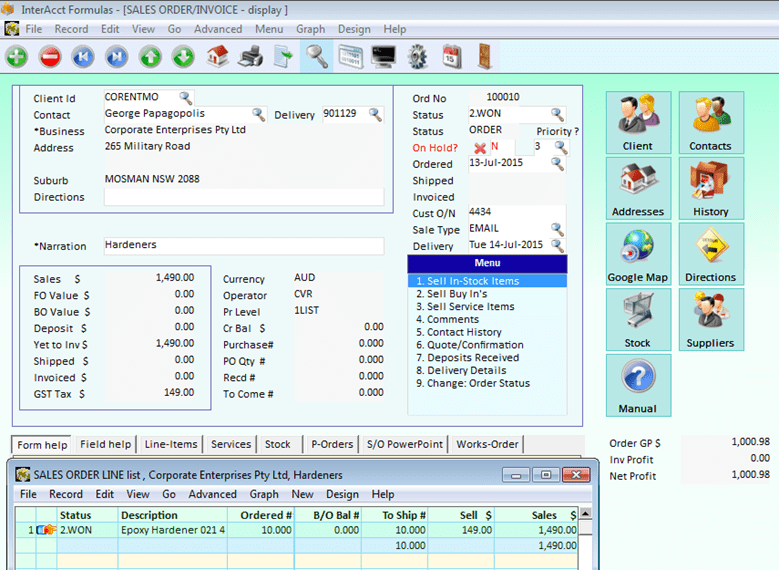 If related to a Sales Order, then this is updated to indicate it is now ready for despatch. The Paint Software and Chemical Software look at both volume and weight formulations in batch quantities with differing packaging sizes. There are numerous standard reports within InterAcct, and these can be personalised to suit. The database of files, fields, and menus can also be personalised to suit individual requirements. 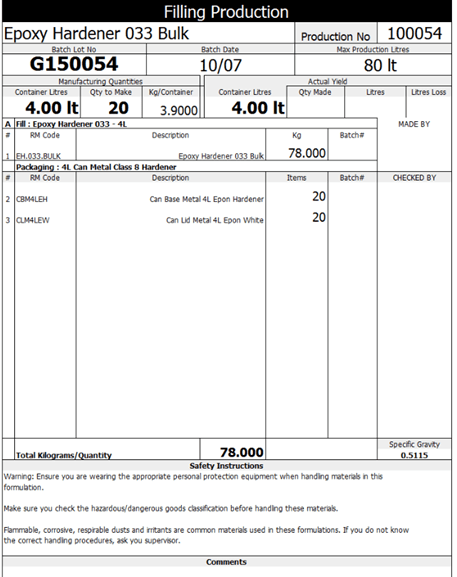 Material requirements can be shown gross, and “Net” of available stock. 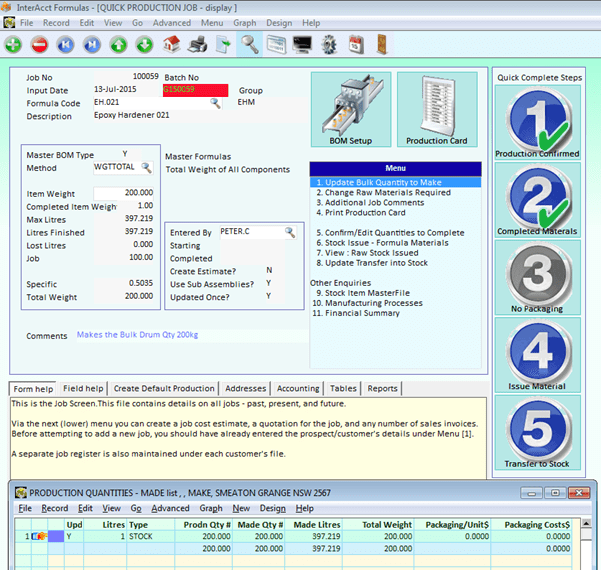 Manufacturing Paint Software to calculate chemicals needed, as well as other information such as viscosity, Ph levels. Multiple tin sizes can be “made” in the same production run. 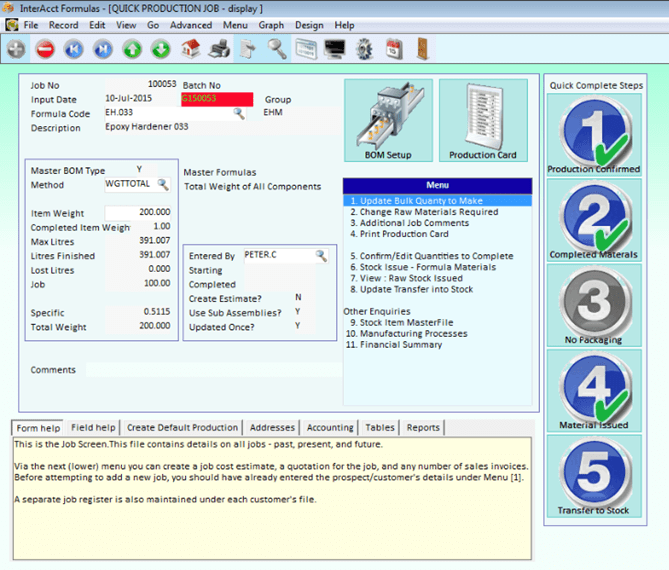 Manufacturing Ink Software to calculate chemicals needed, as well as other information such as viscosity, Ph levels. Manufacturing Chemical Software for any other types of chemicals that you would like can also use this version of the software.